In Lee’s own study of 55,000 adults, including more than 13,000 runners, he found a lower risk of death over the follow-up period in joggers with the highest running time and frequency – nearly three hours a week and at least six times a week – compared with non-runners. It was published in 2014, also in the Journal of the American College of Cardiology. This study has been sitting on my desk for over a month whilel I pondered a response. Initially, I was in Dr. Lee’s camp – higher level of exercise, higher benefit. However, both my clinical experience and personal experience have me moving toward the new study – maybe a little less is better. The math on Dr. Lee’s study also seems to be off. If you are running a total of almost three hours a week, six times a week, that’s less than 30 minutes per run. You might train for a 10K that way, but that is certainly not anything like the distance running needed to train for a marathon. I have always disagreed with running daily. You are much better off running alternate days and doing some cross training, if you like, on the days you don’t run. A study released last week on AF (atrial fibrillation) in athletes caught my attention and prompted me to respond to the earlier study It focused on left ventricular hypertrophy (LVH) from endurance exercise as an important factor in the onset of AF. 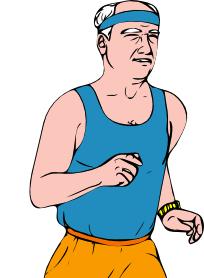 The author labels himself as a “reforming exercise addict” with LVH and AF. Although I don’t consider myself an exercise addict, I have trained for and competed in a marathon, several century bike rides and some triathlons. I have LVE and AF, just like the author of the study. I also have seen this pattern clinically over the course of many years. I just didn’t make the correlation until I reviewed this study. Exercise is good, running is good for you but you need to support your body to heal as well as work. If you are exercising several hours a week, get a cardiac workup. Find out if you have left ventricular hypertrophy. Many years ago, I was led to believe that LVH is a good thing, and it probably is in that it increases your cardiac output. However, I believe that it also predisposes you to atrial fibrillation. That is a condition to avoid.